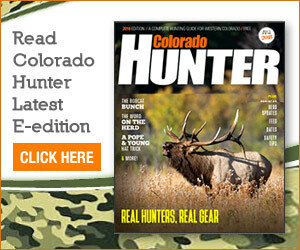 Want a change from hunting elk or mule deer? Try going after a moose, the largest deer in the world. The Colorado Division of Parks and Wildlife reintroduced moose to the region — North Park, specifically — in 1978. In 2005, it introduced moose on Grand Mesa, and in 2008 it transferred another group of moose to the Flat Tops Wilderness Area near Meeker. Since these reintroductions, moose have thrived the area, spelling a good chance of success for properly prepared hunters. The giant herbivores, which can reach six feet at their shoulders and top 1,000 pounds, love western Colorado so much that their numbers continue to grow. The North Park population is estimated at more than 500, Middle Park topping 300 and Grand Mesa about 250. If you were lucky enough to pull a license this year — only 189 licenses were issued statewide this year for 11,000 applicants — be patient on your hunt; moose are relatively solitary and can be difficult to find. Stick to forested areas, particularly those near marshes and swamps. Any area thick with willows, their primary source of food, also is prime habitat. Moose also eat pine needles and the leaves of deciduous trees as well as aquatic plants and aspen trees. Your best chance to see one is early in the morning or late afternoon. Be aware that they can be extremely aggressive, especially when startled, and are known to defend their home territory. Last year, more than a dozen moose were killed by hunters who thought they were shooting cow elk. Know the difference. Illegally shooting a moose carries a fine starting at $1,350. Found in almost any high-country habitat area of Colorado, moose inhabit lodgepole pine, oak brush, aspen, spruce, fir and even sagebrush — often the same areas where elk live. But they’re vastly different in size, color, antler shape and habits. A mature bull moose weighs 1,200 pounds — twice that of the average bull elk. Moose are dark brown and appear almost black. Elk are light brown or golden, with a pale yellow rump. Moose also have large, bulbous noses and a “bell,” or large flap of skin, hanging under their throat (an elk’s snout is narrower with no “bell”). Bull moose also have broad, flat antlers, unlike the pointed antlers of an elk (warning: the antlers on some young bull moose haven’t flattened out yet). Other telltale features include white/gray inner legs and an overhanging snout. Moose also act differently than elk. Typically, moose will not flee like elk at the sight of a hunter. Your best bet: Always identify your target before shooting with the help of binoculars or a spotting scope.